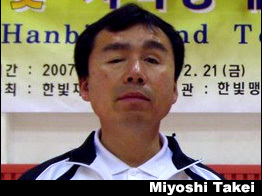 Blind tennis was created in Japan, in Kawagoe in 1984 by Miyoshi Takei. He was a blind student who wanted to play tennis, and along with his physical education teacher, they tried to adapt this sport. After working several years developing the ball and the rules, as more a more people started to lay the first tournament took place in Japan in October 1990. So in 2007 Takei embarked on a world tour to spread the game in the hope of it become one day a Paralympic sport. 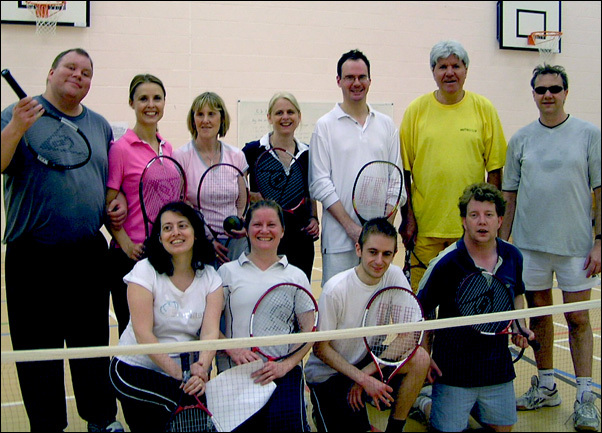 Early in 2007 I received an email inviting me to a demonstration of Soundball Tennis at the Seymour Leisure Centre near Baker Street, I was a bit sceptical but intrigued, how could a blind person play tennis? So I went and I was absolutely bowled over and inspired by the amazing demonstration Takei and his colleagues gave us, I immediately gave my email contact and could not wait to start. A few weeks later Robert Kershaw started some regular sessions and this is how I joined Metro Blind sports. We started in a sports hall in Southfields on badminton courts with the help of Brian from the Cheam tennis club who’s wife was a puppy walker for Guide Dogs. We were so taken by the sport that we help our first competition on the 29 July 2007, David Samuels won the Men’s single and Odette Battarel the Ladies single. We then got a few enquiries from friends who were totally blind and wanted to join in too, but at this stage, we did not really know how to coach them, how do you start? what drills do you do? So we decided not to reinvent the wheel but to go to Japan and learn. Following some successful fundraising, we raised enough money to go and we had the support of the tennis foundation who were also getting intrigued by all these enthusiastic new tennis players! So in May 2009 just one day after the planes were grounded due to the volcano, Alan Whetherly, Amanda Green and myself Odette Battarel plus 2 sighted members from the tennis foundation got on a plane to Tokyo. This was an amazing experience, we met a number of Blind tennis clubs, met the players, were given demonstrations and played tennis with each other, and just like us they enjoyed not only the physical activity but also the social aspect of being in a group of like-minded people and benefited from the peer support they gave each other and the fun and laughter at the pub after a session on court!. Back in London, we started to run some B1 (totally blind) tennis sessions and recruited volunteers from the Highgate tennis club whom we met at one of our tournaments. As more a more players started to play, as we became more experienced we wanted to develop the game for it to be as close as possible to Tennis as we know it, so we tried playing on a regular tennis court using the size of an orange court, and on the other side of the world the Japanese were also making better balls. Many discussions and debates took place and the game and the rules are still evolving. In the meantime, a number of our players also pass the LTA tennis coaching level 1 and then level 2 so we could coach too and we started to work with the tennis foundation to develop a module for coaches to coach blind and visually impaired players. We knew that for this game to grow it had to go beyond Metro blind sport, beyond London, so we supported a number of events like during the Paralympics in 2012, doing demonstrations and coaching across England, in Eastbourne, Brighton, York, Sunderland. From 0 players in 2007, there are now around 600 players who play regularly in the UK. Metro Blind Sport hosted the first few yearly tournaments and as other clubs grew and started to run their own, the Metro tournament became the National tournament, the genie was out of the box ! it could not be stopped, soon the Tennis Foundation gave us more and more support and is now organising Regional and National blind tennis tournaments across the UK and has sent a team to compete in May in the very first International Blind tennis tournament in Spain. Looks like we are well on the way to make Takei’s dream come true to make Blind tennis a Paralympic sport!. On Sunday the 29th of July 2007 at the Aspire Sport Centre in Southfields Community School in Wansworth, a group of 17 blind and visually impaired men and women from all over London and beyond came together for this important event in the history of disabled sport. After 5 hours of solid playing on 3 courts, a round robin with the best of 3 games and semi-finals and finals with the best of 5 games, Dave Samuels won the men’ s single and Odette Battarel won the women’s single. The trophies were presented by Roy Smith the Chairman of Metro and Rob Kershaw a VI sportsman from South Africa. In 2011 Mr. Takei passed away, a victim of a train accident. In fact, during 2013 Blind Tennis had a great evolution and finally its international launch was completed in February 2014 with the creation of the International Blind Tennis Association (IBTA), which now regulates the sport and aims to spread it around the world. In this first Congress the rules were unified for all countries that practice the sport, leading to the appearance of international regulations. In September 2015 the 2nd International Congress took place in Italy, where the Executive Committee of I.B.T.A. was established, which is responsible for the organisation, coordination, promotion and dissemination of Blind Tennis in the world. Tennis AGM & Social 7 March!